This methodology combines scope, schedule and resource measurements to assess project performance and progress. All of these formulas use EV either subtracting from it or dividing into it. Understanding “value” means actual project work it is easier to grasp the calculations purposes and how you could use them. Purpose: This the actual work (value) that has been completed in the project by the team. It is calculated by multiplying the projects budget by the % of work completed. Purpose: This is the planned work (value) in the project plan that was expected to be completed at a given time before the project started. Similar to EV it is calculated using % of work planned multiplied by the projects budget. Purpose: This is the difference between earned value and planned value. It gives you a measurement of how much a project is ahead/behind schedule. Purpose: This is the difference between earned value and actual cost. It gives you a measurement of how much a project is under or over budget. If EV line is below PV, the project is behind schedule; if EV is above PV, the project is ahead of schedule. If AC line is below PV, the project is within budget; if AC is above PV, the project is over budget. 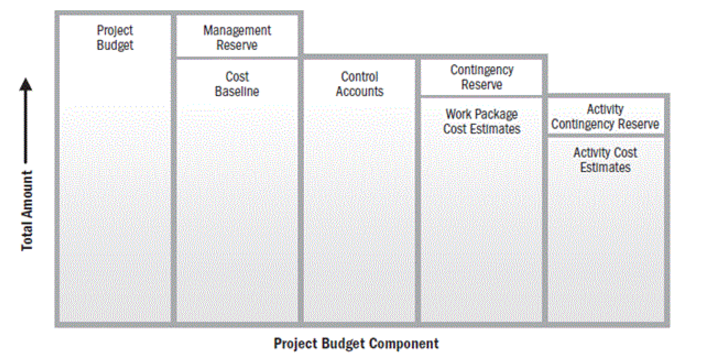 Judging from the chart above, we can infer that the project is within budget but behind schedule. 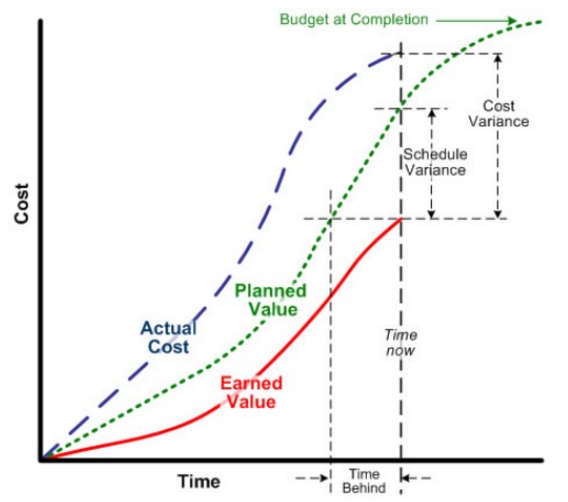 Purpose: This the schedule status expressed as a ratio of earned value to planned value. Exam Tip: You will be given an SPI index figure and you will need to determine if the project is behind or ahead of schedule. The best way to determine this is remember high is good, low is bad ie.if less than one project is behind schedule and if above 1 it is ahead of schedule. The project is on schedule if SPI equals to 1. Formula: This the schedule status expressed as a ratio of earned value to actual cost. Exam Tip: You will be given an CPI index figure and you will need to determine if the project is under or over budget. The best way to determine this is remember high is good, low is bad ie.if less than one project is over budget and if above 1 it is under budget. The project is on budget if CPI equals to 1. You are managing an industrial architecture project. You’ve spent $26,410 so far to survey the site, draw up preliminary plans, and run engineering simulations. You are preparing to meet with your sponsor when you dis cover that there is a new local zoning law will cause you to have to spend an additional estimated $15,000 to revise your plans . You contact the sponsor and initiate a change request to update the cost baseline. What variable would you use to represent the $26,410 in an earned value calculation? You’re working on a project that has an EV of $7,362 and a PV (BCWS) of $8,232. What’s your SV? You are working on a project with an SPI of .72 and a CPI of 1.1. Which of the following BEST describes your project? Your project is ahead of schedule and under budget. Your project is behind schedule and over budget. Your project is behind schedule and under budget. Your project is ahead of schedule and over budget. A project has a BAC of $4,522 and is 13% complete. What is the earned value (EV)? There is not enough information to answer. You are managing a project laying underwater fibre optic cable. The total cost of the project is $52/meter to lay 4km of cable across a lake. It’s scheduled to take 8 weeks to complete, with an equal amount of cable laid in each week. It’s currently the end of week 5, and your team has laid 1,800 meters of cable so far. What is the SPI of your project? Purpose: You use this formula when trying to determine the new estimate at completion and the original planned value. Purpose: To forecast whether or not you can stick to your budget. Purpose: To determine how much work more money will it cost to complete the project you would simply subtract what you already spent from the expected total budget. For Advanced Earned Value Management Take 15 Question Quiz by iZenbridge. Some of the questions are from Head First PMP Book which you can purchase here.